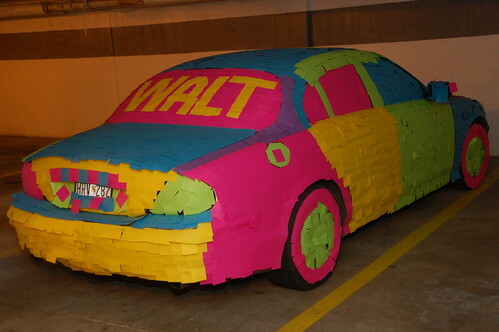 The Post-It Note Car (The Original Post-it Note Jaguar!). What we did to Walt's Jaguar on Friday (not that I was there or anything...). Read the story and view the video from ABC World News . This photo was a Yahoo! pick of the day. It is also now featured in a "Ripley's Believe It Or Not" book. Now the 3M Post-It people have copied it without permission. View the entire set including links to sites from around the world that have written about them. UPDATE: All of these images are posted under a Creative Commons Attribution license, which means that you may post these photos on your site or in an email provided that you ALWAYS ATTRIBUTE AND LINK back to the source (this page is fine).